Mt. Airy, North Carolina— Farm to Feet, makers of 100% American socks, today released a limited-edition sock in support of The Conservation Alliance’s We Keep it Wild campaign. The sock that celebrates the organization’s 30th Anniversary is available online through the month of April at farmtofeet.com. Modeled after Farm to Feet’s performance trail sock, the Damascus, this lightweight 3-quarter crew features targeted cushioning, reinforcement zones, and is made with ultra soft 19.5 micron US merino wool. Knit into the shin area is The Conservation Alliance logo. “Our partnership with Farm to Feet helps us further our mission to protect wild places in more ways than one,” said Josie Norris, program manager at The Conservation Alliance. “In addition to paying annual membership dues, they are going above and beyond to raise awareness about our 30th Anniversary and raise money for us throughout the month of April. 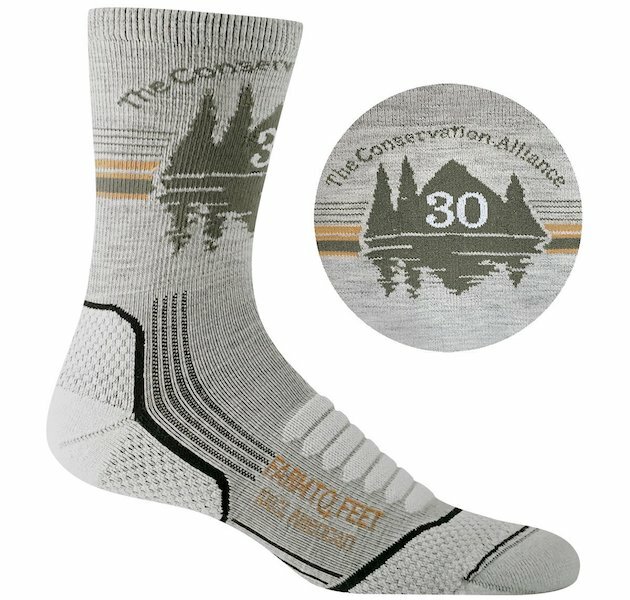 “The Conservation Alliance 30th Anniversary sock retails for $23.50 and is available now at farmtofeet.com. Farm to Feet™ is committed to the single, simple goal of creating the world’s best wool socks by exclusively using an all-American recipe: US merino, US manufacturing, and US workers. With its supply chain completely within the U.S., Farm to Feet is able to ensure the highest quality materials and end products, while having as little impact on the environment as possible. Once the wool is grown and sheared in the Rocky Mountains, the remaining processes take place within 300 miles of its sustainability-focused knitting facility in Mt. Airy, NC. All Farm to Feet socks feature seamless toe closures, a comfort compression fit from the top through the arch, and superior cushioning for ultimate performance and comfort. Learn more at www.farmtofeet.com and join us on Facebook.